The new year’s predictions for higher ed are out in the last week. It’s not surprising that many of the predictions hover around technology. I want to offer a response to a theme that recurs across many of these new years forecasts, about 2018 being the year that small colleges make a big splash in online learning. I have no qualifications as an influencer, futurist, or fortune teller. My response to predictions of online learning in small colleges is rooted in practice, not prediction. Towards the end of 2017, I had the privilege of joining an ongoing open conversation on digital learning and the liberal arts at the University of Mary Washington. This post draws directly from my presentation, “Getting proximate, going for broke: On digital learning, education, and social justice” (which is online here). In the last stretch of the talk, I sought to bring education and social justice directly into conversation with online learning in the liberal arts. Some of this I tweeted in the days before the talk as I prepared, steeped in the early writings of Maxine Greene (who remarkably did actually predict, in the late 60s, where we would be today with edtech). Some of this I’ve shared since. But it seems timely now, in response to the predictions, a call to action from the work in online learning Muhlenberg. What should we say about online learning and social justice, if we speak from commitment not consumerism? How do we move towards an interpretation of online learning that gets proximate to the issues of inequality and injustice we need to support? The first social justice issue is this: online learning may open the door to an unprecedented scale of commodification in higher education. This is already underway and what troubles me most is the degree to which this path appears inevitable. We need to think strategically about how together we can challenge the epistemology of efficiencies and scale that dominates the Silicon Valley inspired dreams of online learning. We must find openings and alternatives, gathering inspiration from Maxine Greene and others to attempt to look at things as if they could be otherwise. To engage our campus leaders in looking at things as if they could be otherwise. To engage our students in looking at things as if they must be otherwise. We need to imagine collaborative models and communities of practice that cross institutional, disciplinary boundaries, so that we can work together to limit commercialism in the digital liberal arts, which is also to advocate for limiting surveillance and extraction of student data in digital learning. We need a vision of online learning that supports democracy, equity, participation, access, well-being, over one that privileges commodification, surveillance, and consumerism. We need a vision of online learning that values education as the practice of voice and freedom. We need a vision of online learning rooted in our liberal arts ethos but that also extends outwards towards those for whom a liberal arts education in a small residential environment is not within reach. We need a vision of online learning that recognizes all students as fully human, as digital citizens, and treats all students equitably, over one that conceptualizes students something even less than consumers, as data points. We need a vision of online learning that engages pedagogies that practice the value of voice, over one that denies student voice matters. We need, in short, a cooperative alternative to the dominant political and economic entities organizing rapidly around the production and provision of online learning. We need to get organized around activist digital learning that aims to expand the range and possibility of digital resources available to educators and learners. We have models for doing this in multiple areas of digital learning. 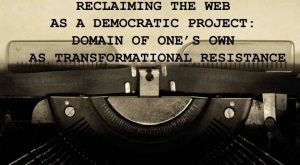 Domain of One’s Own, movements around open education, emerging alternatives to concentrated ownership and control of academic publishing. To my colleagues in the field of media and social justice, I would say that online learning should be recognized as a leading edge of media activism in 2018. How might we generate with all of this collective spirit an approach to online learning critically and consciously informed by a social justice orientation? 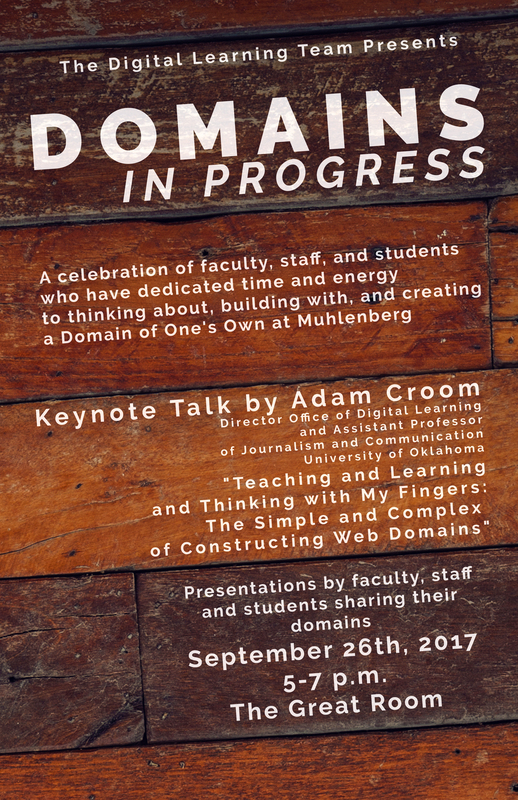 We’re getting ready here for a 2-day visit from Adam Croom, director of the office of digital learning at University of Oklahoma who has done so much to help inspire and and strengthen our still fledgling Domain of One’s Own initiative at Muhlenberg (DoOOM). Adam’s visit is the official launch of DoOOM campuswide, after a much smaller spring pilot with a faculty learning community and students enrolled in their courses. 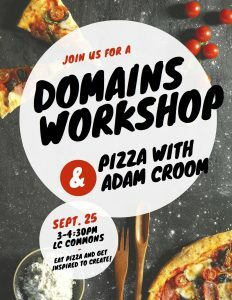 On Monday, we’ve scheduled time for students to work with Adam on their domains. The first Muhlenberg students signed up for domains last spring, just about 6 months ago. Several more students signed up for domains a few weeks ago with the start of fall courses integrating DoOO in their work. So time with Adam, who has been working with students on DoOO for a few years now, will be productive and purposeful. The opportunity to look at students’ domains from OU, and to hear about the work and ideas growing there, will hopefully help students at Muhlenberg develop an understanding that the work they are beginning with DoOOM is connected to something larger than our small campus. The following evening, Adam will headline an event, Domains in Progress, that celebrates and recognizes the time and energy faculty, staff, and students have directed towards their domains since last spring. This is the part of the two-day visit I’m most looking forward to, because it affords us a much needed opportunity to pause in the work and take some measure of its meanings, early impacts, challenges, and possibilities. 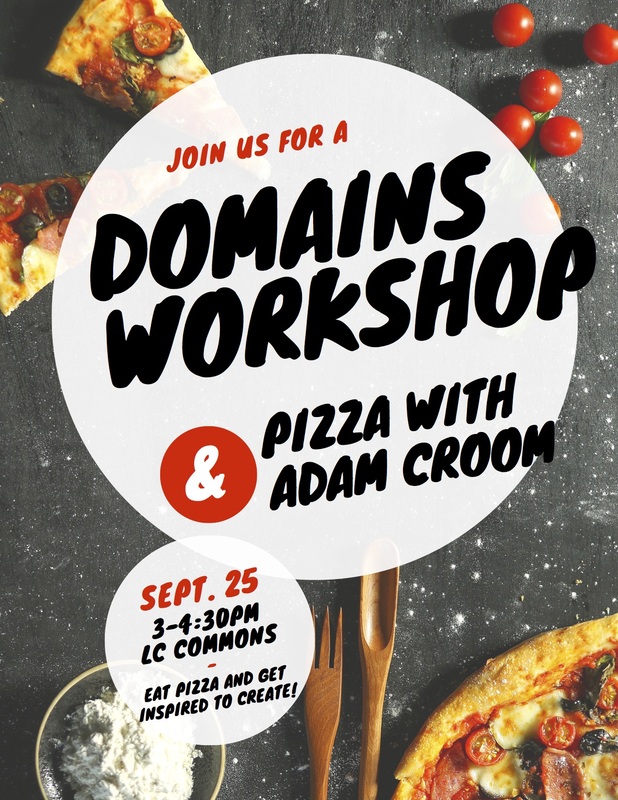 Faculty and staff participating in the DoOOM FLC collectively decided last spring that we’re not quite ready for a “showcase” of domains, like the Creaties at OU. But six months into this work, it’s a perfect moment to recognize the early progress faculty, staff, and students have made in imagining how domains can be a resource for building a better home on the web for teaching, learning, and scholarship in the liberal arts. Most of all, in welcoming Adam to Muhlenberg we’re inviting reflection. Reflection is a practice and a habit that we aim to cultivate among students in the liberal arts learning, but often have too little time for our own regular reflective practices. Without time to reflect, it is all too easy to become detached from the meaning that shapes the work in the first place, as well as the relationships that are at the center of our digital learning efforts. If DoOO is about reclaiming some control over our data, our digital identities and presence, the space of these next two days holds promise as a kind of retreat into reflection and dialogue that is nearly impossible to sustain in our current schedules on campus. Everyone seems to be juggling an impossible number of projects and pressures. So we get to slow down just a bit, just enough to reflect on and think collectively about what we want Domain of One’s Own at Muhlenberg to look like. This begins with recognition and thanks for the thoughtful efforts and expertise of Tim Clarke, Jordan Noyes, and Jenna Azar, as well as the Digital Learning Assistants, who play such a significant role in cultivating a community of practice around DoOOM. (And without whom we really would be DoOOMed). Yesterday I published a post based on my Domains17 Conference talk. There are so many people thinking, writing, speaking critically about A Domain of One’s Own. My aim was to talk a little about how I approach the project from a media studies background and how it might be connected to the critical social justice mission of the media & communication department where I teach. Part of the story I was telling revolves around work that is deeply rooted in a commitment to community collaboration: the HYPE youth media program. For a decade, Jenna Azar and I have been creatively, boldly, sometimes defiantly working to ensure that HYPE is situated at the forefront of, and integral to, our department and campus commitments focused on critical civic engagement, student agency and voice, equity and inclusion. 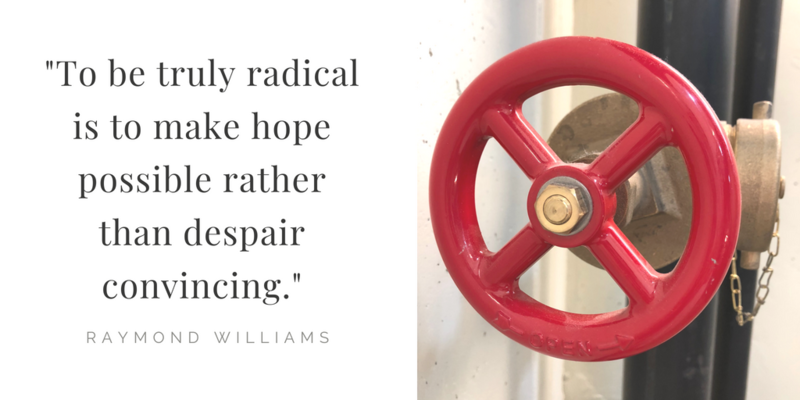 We’ve held HYPE up as a model for partnership with community that is rooted in an ethics of reciprocity and recognition that such work must aim to transform our own institution as much as it imagines it is supporting positive transformation within the community. We’ve also invited our colleagues to consider HYPE a pedagogical space that prioritizes what Michelle Fine calls “critical civic scholarship,” engaging students, ourselves, and community partners “intimately with the thick complexity of what it means to ‘do’ civic.” (Fine, 2012, p. 36). Jenna and I know from teaching an advanced Youth Media course that these collaborations can generate transformative experiences for students who are interested in joining their studies in media and communication with struggles for media justice. For many, it changes what they study, what paths they pursue after they graduate. Later in the evening, I got a text from Jenna, who was just returning from the Intergroup Dialogue Conference at Cornell University in Ithaca, NY. It was a link to another blog post, written by a 2013 graduate who was closely connected to HYPE through the Youth Media course we team teach. Experience with HYPE and youth media, encountering Freire and Pedagogy of the Oppressed in particular, opened up for Julie new possibilities for imagining her future. For the first time, in her senior year of college, Julie (a scholar athlete and award-winning member of the college’s women’s basketball team) began to seriously consider becoming a teacher and towards the end of that semester she was interviewing with Teach for America. Julie was one of the students I had in mind when I wrote the passage above. I was thinking about the community of learners we try to create around HYPE and youth media. It’s been four years since Julie graduated. 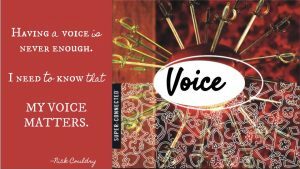 And on her WordPress blog, where she continues to offer a narrative of her experience as a novice teacher, she quotes Couldry’s Why Voice Matters. These glimpses of what she is doing beyond graduation, the identity she is constructing as a teacher, matter deeply. That she continues to try to enact and embody some of the theory and principles that she encountered through HYPE four years ago is why HYPE matters on our campus. 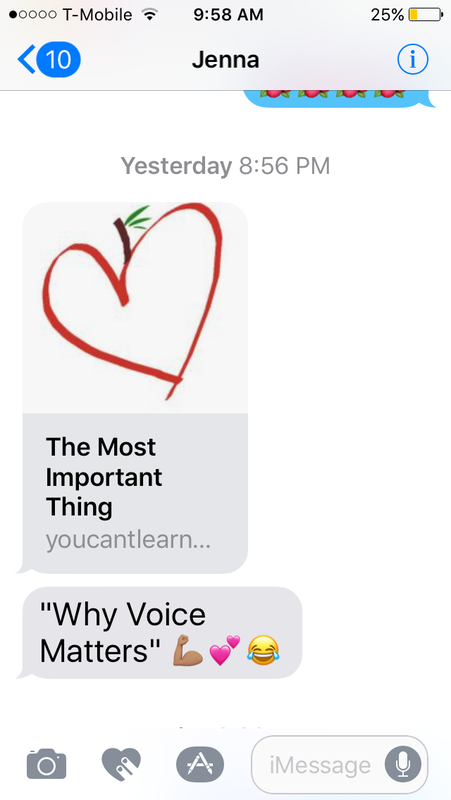 That she sees her work as a teacher to include, centrally, practicing the value of voice, is perhaps the most powerful reminder of why voice matters. This is a rough transcript of my talk at Domains17. So what could possibly go wrong here this morning? While there are a lot of familiar faces here, I’m relatively new to this Domains community. There are a few things to know about me that may help in understanding how Domains is situated within our work at Muhlenberg College, a small residential liberal arts college in Allentown, Pennsylvania. (If you want to know a little more about Allentown and the region, you can take a look at one of the projects a recent group of students completed on the history of slate in the Lehigh Valley, my first collaborative Domains project). At Muhlenberg, I am a professor of media and communication, as well as the associate dean for digital learning and director of a consortial minor in documentary storymaking. My teaching, scholarship, and leadership has long been preoccupied with struggles for media justice. For two decades, my scholarship has been directly tied to youth media, and for the last decade that has been grounded in a rich and transformative collaboration with Jenna Azar, along with our extraordinary colleague Anthony Dalton. Together we co-direct the HYPE youth media program in Allentown (Tony is reimagining the HYPE website this summer so please check back later to see the awesome youth produced documentaries HYPE teens have dropped recently). When I started teaching, as is the case for many new junior faculty, I was responsible for teaching the introductory course in the major, “Media and Society.” The focus in this course was to introduce students to a critical analysis of the political economy of media and communication. The goal was to help students develop an understanding of the context and impact of corporate media concentration within democratic society. I imagined that I was providing students with a critical lens for viewing mainstream media, hoping to make their quite familiar media landscape newly strange to them. So that they might see it with fresh eyes, with critical distance, and through the frameworks of critical media theory they were encountering in the course. I recall vividly, towards the end of my second year, chatting with students before the start of class. When I asked what they did over the weekend, one student commented that he’d been to the movies and added: “Dr. Taub, you ruined movies for me.” Other students voiced agreement. When I asked how I managed to ruin movies for them the student said, “ever since you taught us about product placements, all I can see are products, I’m on the lookout for products, and it completely takes the fun out of watching a movie.” He even added that his friends didn’t want to go to the movies with him anymore because he was so distracting pointing out all of the product placements to them throughout. I might have thought to myself: good! I’m doing my job then. They’re watching film critically. Of course, I wanted to help students develop a critical understanding of how media ownership shapes and constrains meaning making in our social world. But I didn’t want to ruin their media for them. I didn’t want to deny them the pleasures of engaging in media practices, even as consumers of commercial media. As we talked about this, students shared that they were leaving my classes feeling empowered with critical theory but also feeling helpless, some even used the term depressed, by their inability to do anything that might counter the hegemony of corporate mass media and popular culture. Maybe students were developing critical awareness but I hadn’t made it possible for them to extend that understanding into critical action. Simply put, I had cut off their right to be happy. While there was satisfaction in grappling with difficult theory, there was no joy in their learning. In their extended dialogue on learning and social justice, Paulo Freire tells Myles Horton, “Seriousness fights against happiness.” (Horton & Freire, We Make the Road by Walking, 1990, p. 171). This was in stark contrast to what I was seeing in another core class I had the privilege to teach, Documentary Research. While the first course in the major focuses on critical media analysis, in this second course, the focus is on helping students develop as responsible, ethical media makers. In this course, originally developed by my colleague Sue Curry Jansen, students encounter the history of documentary expression and connect that to their own documentary practice in community settings. Students create 2-3 minute digital stories that they research, edit, produce, and share with their peers and community members. They are empowered with tools, support, and space to construct meaningful narratives in collaboration. 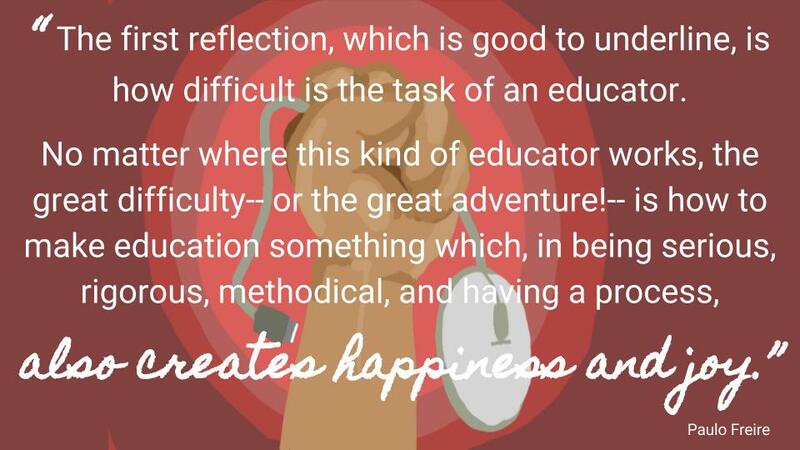 Paraphrasing Freire here, inside the difficulty of learning documentary methods, digital tools and editing software, self-knowledge and happiness begins to be generated! In Documentary Research, while students struggle with the ethics and methods of documentary storytelling, they reach the end of the course happy with their results and proud of their individual and collective efforts as novice digital storytellers. And students recognize that this pleasure and satisfaction and meaning comes from rigorous, difficult work. In fact, when alumni come back to campus and are asked about the course experiences that have stayed with them over the years since graduating, they always talk about this course. Only a very few graduates of our program go on to pursue lives as documentarians. But that’s not the point. In the process of learning documentary expression, students are learning ethics, accountability, connecting to community. They are learning to narrate their own experience in the world through digital storytelling. I felt joyful teaching that course, that is where my teaching felt the most engaged, the most connected, the most meaningful. So I began to consider ways to integrate multimodal composition into my other courses. My desire was to intentionally weave together through my courses experiences that develop students’ practice in critical media analysis, and their practice as ethical media makers. What if I created at the center of all of my courses opportunities for students to narrate their own experiences as learners? What would it look like to choose pedagogies that engage media and digital tools for this purpose? I had the opportunity to begin exploring that through a new general education curricular initiative a few years ago and developed a new course: New Media Literacies. 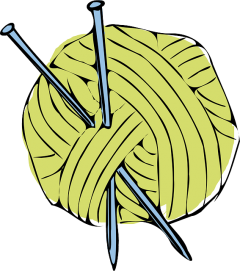 (Some of the work of that course exists here on our course blog). The course explores how young people, in specific cultural and social contexts, negotiate and construct meaning through their use of and engagement with digital tools. At the heart of the course is students’ participatory fieldwork with the HYPE youth media program, where Allentown high school students research, shoot, edit, and produce documentary media about social justice issues in their community. Muhlenberg students collaborate with the teens, in a kind of collegial pedagogy (see Soep and Chavez 2010). Jenna and I know from teaching an advanced Youth Media course that these collaborations can generate transformative experiences for students who are interested in joining their studies in media and communication with struggles for media justice. For many, it changes what they study, what paths they pursue after they graduate. To illustrate, I want to share a story about a student in New Media Literacies, Erik, who just graduated last month. Erik enrolled in the course as a first year student, who introduced himself to his peers on the first day of class as a football player, a first generation college student, Latino, and made it clear that he recognized that responsibility and brought it into the space of the class. He was especially excited about the opportunities for multimodal composition in the course—he had an active presence on Tumblr and Instagram and often came to class excited to share his latest post. Between classes he often sent us provocative posts he read the he was relating to course topics. One morning, he came into class and asked to share a piece he wrote over the weekend. He sat at the front of the room and read a powerful spoke word poem, a reflection he described as prompted by one of the course readings and conversations at HYPE. Erik’s spoken word piece overwhelmed us all. We spent the entire class discussing his piece, which illustrated in so many ways the theories of critical new media literacies that we were reading about. It went beyond those readings to exemplify and embody new media literacy as practice. From the intimate space of our course, Erik then stepped out into the more public space of the annual multicultural block party and performed his piece there, mic in hand. His peers recorded it on their phones and shared it to social media. It was posted to the multicultural center’s facebook page and the likes alone registered just a glimpse of the impact his voice was having. But the video was rough, the sound was poor. So we encouraged him to film it again. Here’s what he did, with Tony Dalton’s support. This was a powerful lesson in what it looks like to create space in class and at the center and corners of campus for students to narrate their experience in the world. Space and opportunities for their voices to be heard by others. To know, to experience, that his voice matters. This was a stepping off point for Erik—a moment at which he enlarged the space of his engagement on campus, going on to become the co-president of Comunidad Latina. Why does this matter? Here’s where I want to extend the conversation on VOICE already happening in the Domains community. To do so, I want to invoke the work of Nick Couldry, a British media scholar, who argues in his book Why Voice Matters that we are experiencing a contemporary crisis of voice—across political, economic, social domains. At root, he argues, is a pervasive doctrine of neoliberalism that denies voice matters. Increasingly, the systems of higher ed in which we work are being reorganized and realigned around the values and interests and logics of neoliberalism. This poses challenges for those of us who see our work as tied to expanding possibilities for student voice and agency. Couldry is not, of course, the only critic documenting the incursions of neoliberalism into education and other swaths of human social activity. But his critique stands out to me for its focus on voice. I won’t do justice to Couldry’s complex argument here, which engages sociology, economics, philosophy, and other theoretical fields. But basically the heart of his argument is this: neoliberalism denies voice matters. Neoliberalism creates systems in which people are treated as if they lack the capacity for voice, for rendering an account of their experience. For Couldry, voice is not simply “expressing one’s opinion or perspective.” Couldry is working with the idea of voice as a VALUE. This includes the act of valuing, choosing to value, frameworks for organizing human activity and resources that put the value of voice into practice. This means choosing against frameworks that devalue, deny, or undermine voice. Note: Couldry published Why Voice Matters in 2010. Since then, we have seen emerge several critical examples of people’s capacities for social cooperation based on voice, including Black Lives Matter, the 2017 Women’s March, the Dakota Access Pipeline protests. Couldry would have us see these not only as forms of political representation—but from a broader account of how human beings are in the world. One response to this crisis, Couldry suggests, is to actively favor frameworks that value voice as a process. And what I want to consider in the remainder of this talk is the idea that Domain of One’s Own is a framework for organizing the human activity of teaching and learning that intentionally values voice as a process. There are so many ways of organizing teaching and learning that undermine, deny, of variously diminish voice–and while I am thinking primarily of student voice, we might also give an account of the ways that faculty voices are undermined, and the ways that staff voices are undermined. In the framework provided by Couldry, we might consider Learning Management Systems, Learning Analytics, Machine Learning, etc. as ways of organizing the human activities of education that deny voice matters. They share in common a market rationality that denies the value of voice (beyond consumer voice). Domain of One’s Own provides the resources and materials from which a student can build an account of herself, a digital, multimodal narrative of her experience in the world. 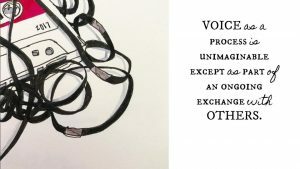 That is a form of valuing voice. I imagine Domain of One’s Own as a nest—a tiny space in a vast wide open sky nurturing intellectual, creative, political possibilities, nurturing communities of critical learners, makers, producers. A place where students’ fledgling interests, ideas, projects are nurtured, cared for. A pocket of possibilities and a structure to shelter new ideas that don’t easily find a home elsewhere online. 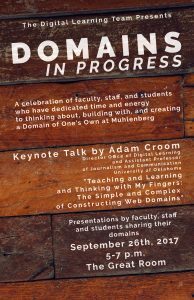 In introducing Domains at Muhlenberg, I’ve closely collaborated with Tim Clarke, who administers our Domains project, has created outstanding documentation, and co-facilitated a faculty learning community on Domains with me. Tim used to have a Twitter profile with a quote from They Might Be Giants: “make a little birdhouse in your soul.” So I’m liking nest metaphor, and it fits with our DoOO instance at Muhlenberg, which we’ve titled: bergbuilds.domains. And it fits, too, with the ways that all of us on the Digital Learning Team are hoping to help students, faculty, and staff build their own domains as space for nurturing their creative and intellectual projects. So many spaces within higher ed increasingly push the value of self-promotion, of marketing one’s skills, and a focus on individualistic gain (grades, jobs, credentials). 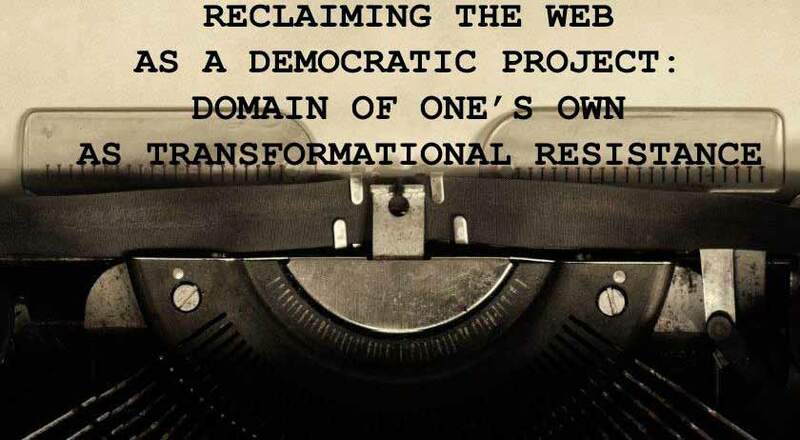 Can Domain of One’s Own be part of an effort to renew a culture that values connection and collective action? Inquiry tied not only to one’s self gain but to some notion of the social good? At Muhlenberg, we’ve only been working with Domains for a semester, so my comments here gesture towards the hopeful. But even in that short time, I see evidence that a domain can be a nest for developing students’ learning as students and as activists who embody a commitment to critical digital and civic engagement. As learners who are developing digital presence beyond market narratives. This is Jazzy’s domain. An art studio major and a Digital Learning Assistant, Jazzy graduated in 2017. 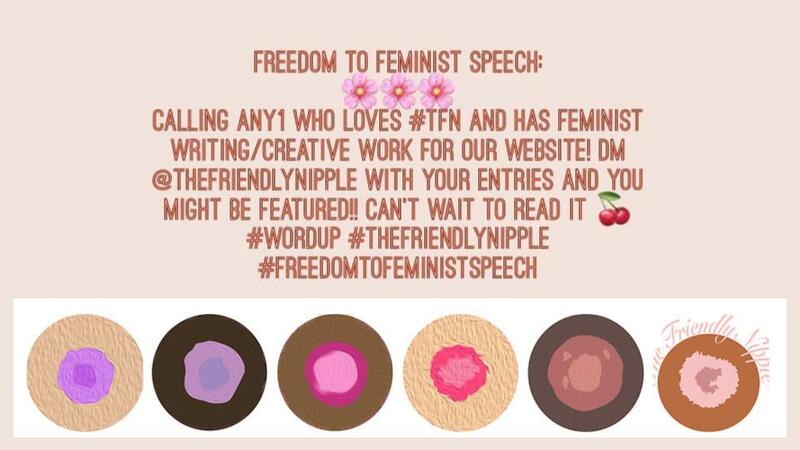 In her last two months of college, she worked with Jenna and Tim to migrate her work off bergbuilds.domains and onto her own domain, TheFriendlyNipple.com. 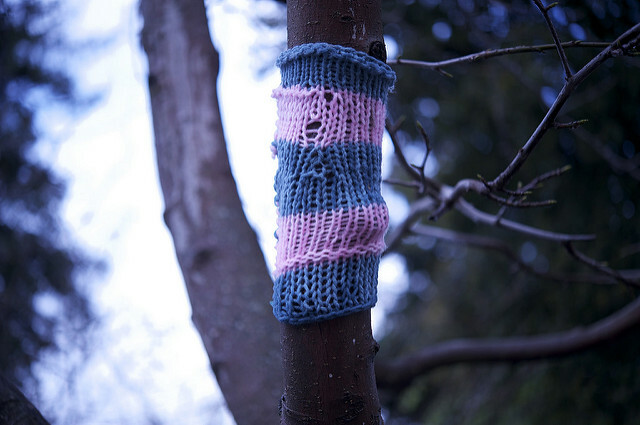 The site documents her senior art project and other work as an emerging artist. Jazzy’s project is such a powerful example of Domain of One’s Own as practicing the value of voice. Here, she’s claiming her own agency, as an emerging working artist, while also using her Domain as a space for other women to reclaim their bodies, a space for female voice. On the one hand, she’s cultivating a powerful individual presence, making her domain the hub for an already intentional social media presence. At the same time, she’s connecting her own personal digital empowerment to a call for collective action and participation. It’s a platform for marketing her work (she sells her work on RedBubble) but it’s not just to market and promote. 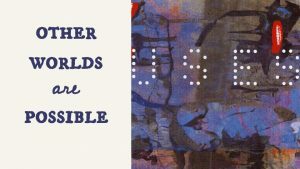 She offers a narrative of herself beyond and unbounded by market logics. It’s not just self-branding. This movement between documenting one’s learning, highlighting one’s growth as a student, showcasing talents and gesturing towards something larger than individual achievements, can be a tricky tension. If Domain of One’s Own is to hold onto any kind of radical possibility for students, it cannot be reduced to self-branding. As we introduce students to Domains, it’s necessary to engage in dialogue that frames the value of creating their own domain in a wider lens. As Martha suggested this morning in her keynote, we need to push “beyond the pragmatic and practical goals of the project,” “to grapple with the Web in deep and discerning ways.” Reclaiming control over their digital identity, their data, their work—that’s important work for students, even vital. But we can also explore with students the need to create the web beyond self-promotion, in ways that hold each other up. The way Jazzy is using her tiny space on the web to hold up other feminists. How do we hang on to the possibility of Domains as a strategy that interrupts the neoliberal attack on voice, on education, on the social? So that it grows as a space for counter narratives like the one Jazzy is offering? As we grow into our second year, building on the strong foundation and support that Adam Croom, Martha Burtis, Jim Groom Lauren Brumfeld and others have generously offered, I want to think of Domains not only as a student’s individual project to reclaim control, agency, and voice, but also as a project that might remind us of what Michelle Fine calls our “desperate need for rich interdependence” (“Critical Civic Research,” Civic Provocations, Brining Theory to Practice, 2012, p. 35) This is what draws me to Domain of One’s Own–a rich interdependence among folks at participating sites. At Middlebury, the Domains project is called MiddCreate and the landing page pictures three people in a garden—two women are holding watering cans and a man is kneeling and has his hands in the soil near what looks to be some Swiss chard. Text over the image says: It’s your digital garden. What will you grow? What I love about this framing is that it lends itself not only to a recognition of the cultivating, nurturing, and growing that happens when students have a domain of their own. But also, as any serious gardener knows, it’s what’s beneath the soil that really matters: a deep entangled intricate network of roots sustaining it all. 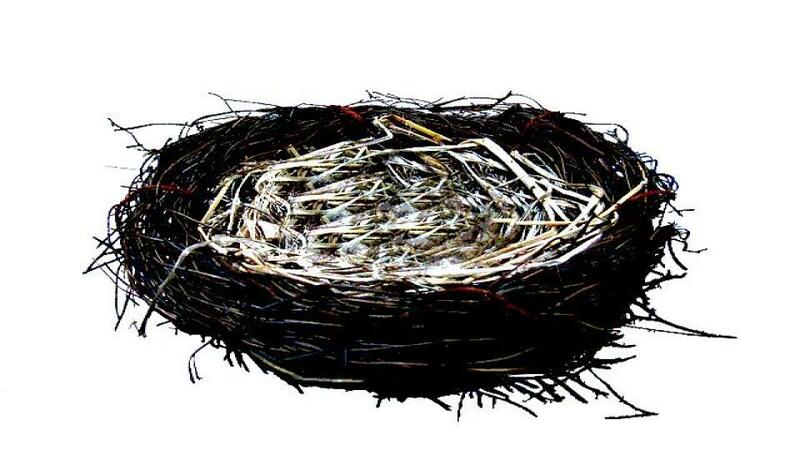 A nest is a kind of pocket. I think that Domains can be a small pocket of resistance (this is a reference to another voice we lost recently, the late John Berger, and his book, The Shape of a Pocket). It can be a resource for addressing the crisis of voice and thinking beyond the neoliberal framework that produces that crisis. 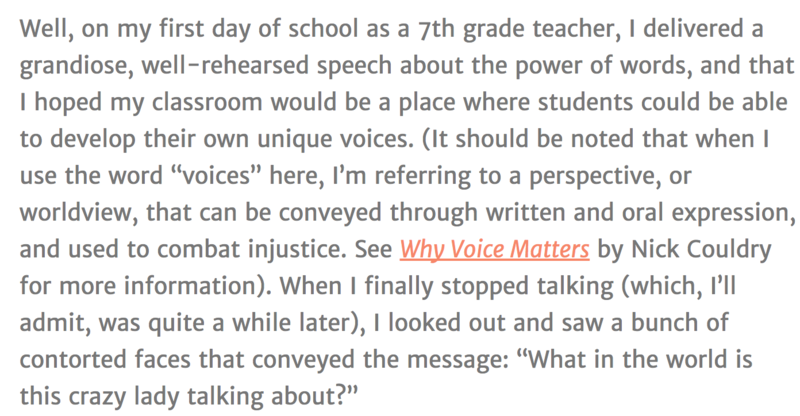 A framework and a set of practices that intentionally value voice. I’m trying to think about Domain of One’s Own as a framework for cultivating student voice as a process—the ability for students to construct an account of themselves, a narrative of their experience in the world. 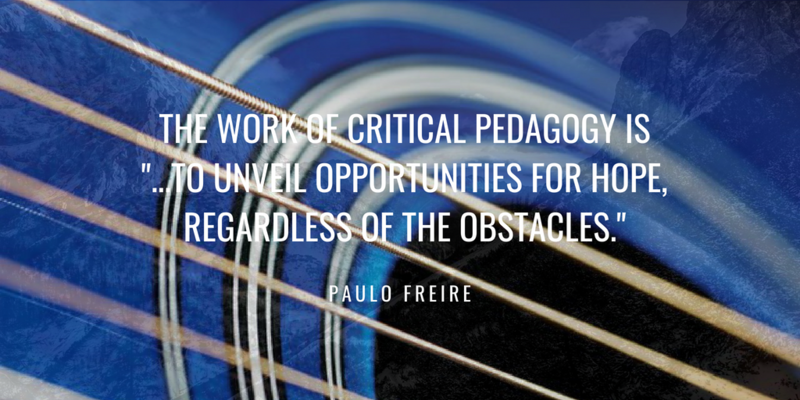 A way of organizing teaching and learning that puts the value of voice into practice, so that students–even when confronted with what seem like almost insurmountable injustices–never give in to programmed helplessness. During the same year that we launched our Domains project, the drumbeat of market competition as the dominant principle in higher education grew louder and louder. Liberal arts institutions have been especially preoccupied with this, hard pressed to justify the value of the soaringly high cost of a private, residential campus experience. Domain of One’s Own can be useful as both a tool and a counter-narrative to the neoliberal reorganization of teaching and learning. Or it can play right into that agenda. Domain of One’s Own can offer a resource for valuing voice as process, for—as Judith Butler says—giving an account of oneself. (“I cannot give an account of myself without accounting for the social conditions under which I emerge.”) For holding onto the belief that other alternatives are possible. We have a long battle to repair the damage of neoliberalism’s assault on higher ed. The growing precarity for contingent faculty labor, increasing focus on revenue generation, academic capitalism, rising tuition and costs…I’m not suggesting that Domain of One’s Own repairs any of this. Of course it doesn’t. But I do think it is possible to situate Domain of One’s Own in ways that might do some repair work around, in particular, technology and voice. It can at least be a resource to help challenge this dominant view of the neoliberal university. 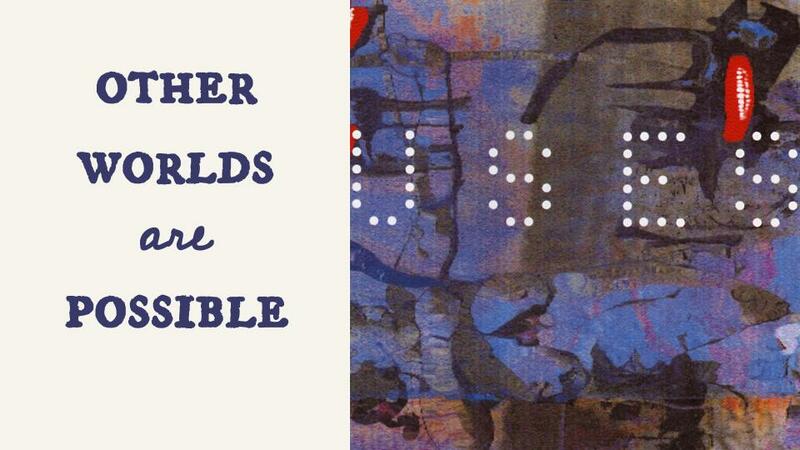 Where are there spaces to continue to imagine that other worlds are possible? 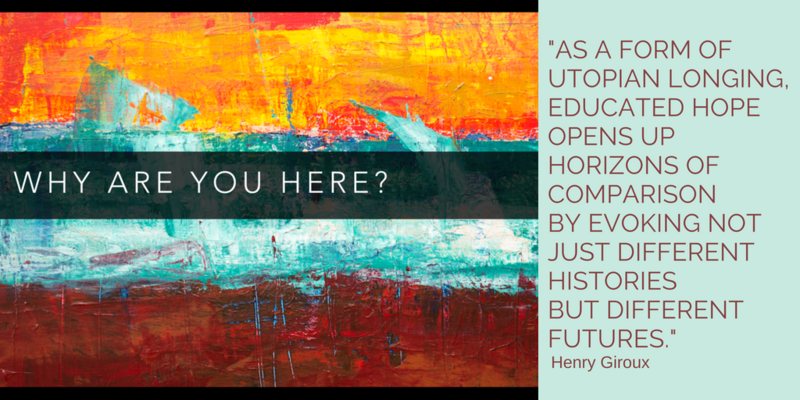 Where are the radical possibilities within higher ed? How can we connect Domains to those initiatives? To civic engagement? Global studies? LGBTQ initiatives? Teacher Ed? Departments with social justice missions? Initiatives like Intergroup Dialogue? Where are the spaces/partners working to advance social solidarities? And how can we propose Domains as an ally, an amplifier, to these efforts? 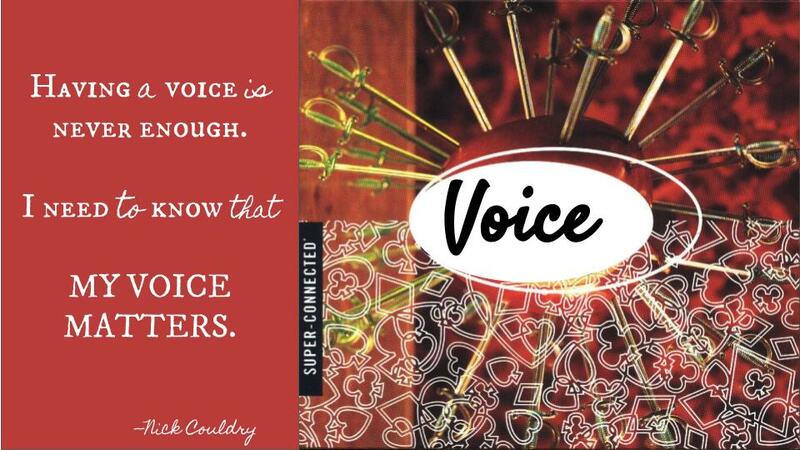 Because voice does matter, not just for one’s own individual benefit, but for the collective. To emphasize something that Martha Burtis explored in her keynote this morning, I want to ask us to think about how we can keep Domain of One’s Own bold and outrageous. How do we protect it from dissolving into the landscape of higher education individualism? As times grow more desperately unequal, we have to sustain community at the heart of Domain of One’s Own, as well as other forms of digital pedagogy and praxis. It can easily be eclipsed by the individualism that characterizes so much of the ethos driving tech implementation in higher ed. Of course we need to know and demonstrate that liberal arts skills are marketable for our graduates. But I think Jazzy and Erik show us that there is more to the story. 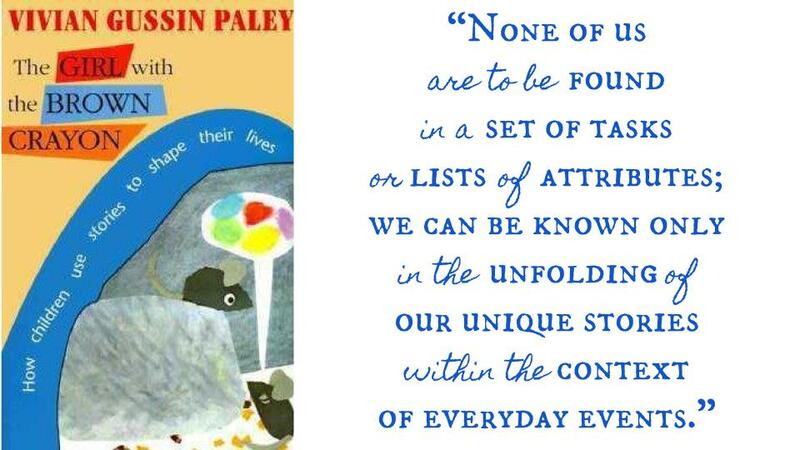 I want to end with a thought from Vivian Gussin Paley. 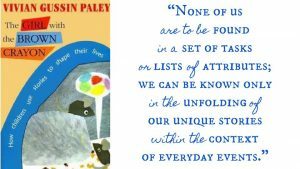 As a kindergarten teacher and an ethnographer of her own sites of learning, Paley offers some of the most deeply humane and incisive critique of educational technology I have encountered. If you believe, as I do, that a brown crayon is also an educational technology. Sharing slides from Domains 2017 here . I’ll share the narrative later today. 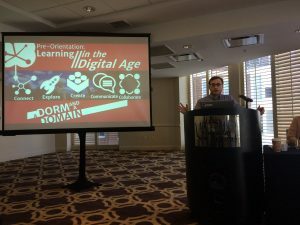 In a recent post, Keegan Long Wheeler reflects on something missing from the OLCInnovate conference. 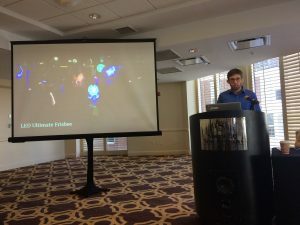 To be honest, OLCInnovate is not alone in being, as Keegan notes, “mostly void of students voices.” The lack of pathways for students to meaningfully participate in higher education conferences is pretty widespread. And the price to attend is pretty steep. Full price student registration for OLCInnovate in 2017 was $400, with early bird pricing a mere $50 less. For anyone who has ever supported conference travel for students, or attended a conference as a student, you know that funding is rarely easy to secure far enough in advance to qualify for whatever meager savings an early bird registration affords. 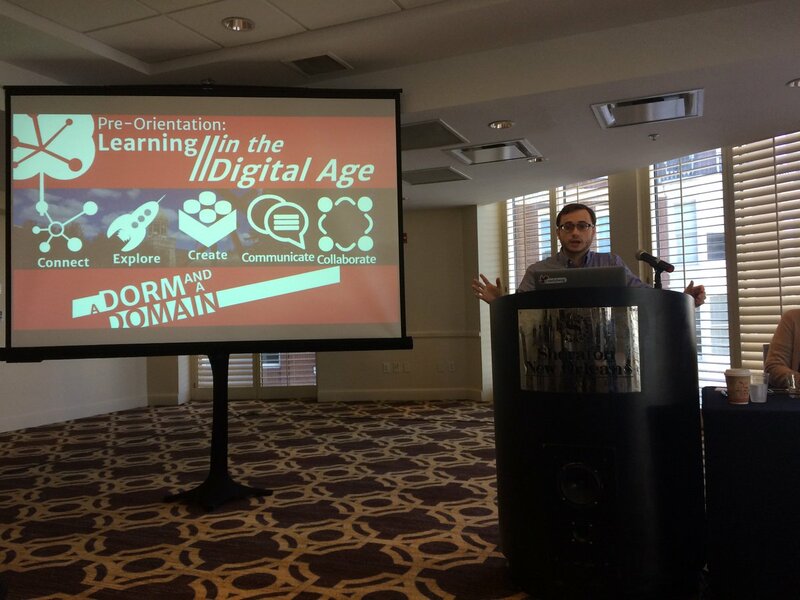 Keegan’s post challenges us to “think about ways you could bring more students to #OLCInnovate and more importantly into #edtech conversations.” As educators who went with students to OLCInnovate, and will have a student on the “bergbuilds” team attending Domains 2017, we want to share a few thoughts in relation to Keegan’s timely and critical challenge. There are obvious financial barriers to students attending conferences. Chris Gillard has also written about the absence of student voice at conferences and most recently about the troubling framing of students as cheaters and liars in particular in the ubiquitous online proctoring advertising and sponsorship at OLCInnovate. One of the first questions Chris asked us when we met at OLCInnovate was how did we manage to fund the cost of bringing to students to OLCInnovate. 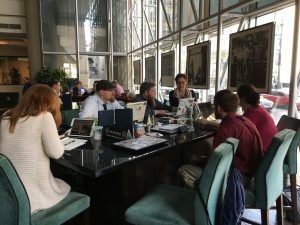 Airfare and lodging for a minimum of 3 days in New Orleans is significant and an obstacle not only for students but for many faculty and staff. With shrinking budgets for conference travel, many of us are having to justify and limit participation at conferences. 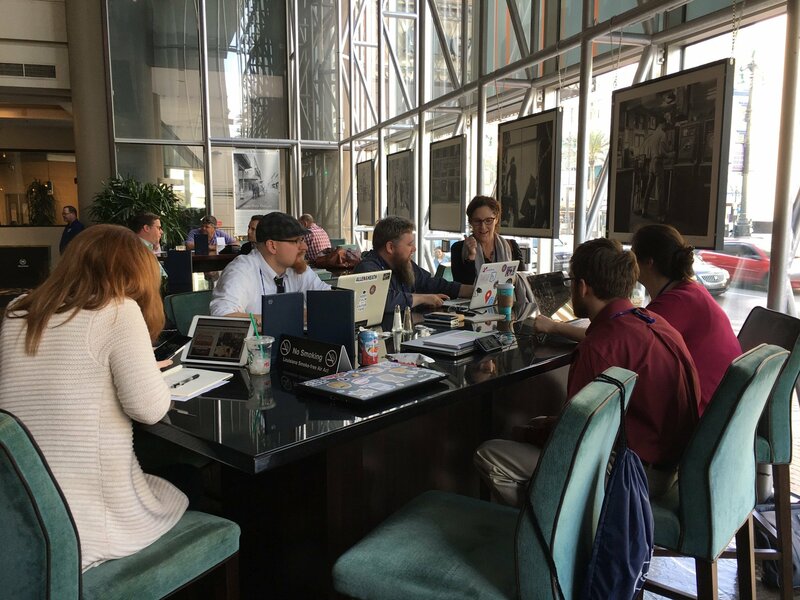 We were able to attend OLCInnovate as a large team, including two students and five faculty and staff, because we had five free registrations. In 2016, our project for the Solution Design Summit won the competition and one of the major benefits was complimentary registration for our team to attend the 2017 conference. Saving the $3100 in registration fees certainly contributed to our ability to fund two student registrations. Muhlenberg students are also eligible to apply for conference travel funds from the Dean, and both of our students received funding that basically covered their roundtrip airfare. Through the digital learning budget, we were able to support a shared hotel room and meals. Muhlenberg is a small residential liberal arts college that values undergraduate research and faculty – student collaboration. Practicing that value means ensuring the resources to support student conference presentations and travel. Realistically, in the future–when we don’t have complimentary registrations for OLCInnovate–practicing that value will mean fewer of us attend so that we can prioritize student participation and presence. Keegan has started to think about possible ways to support more inclusive edtech conference spaces. “Off the top of my head, it would be fantastic if more conferences (including #OLCInnovate) offered to sponsor undergraduates and graduate students that submit proposals, including travel/lodging. Alternatively, if instructors/institutions have access to funds that could be used to encourage students into our scholarship spaces to add their voices. We need to make this a priority.” Certainly with the pervasive branding and marketing at OLCInnovate (which Chris Gillard has described here), there must be resources to sponsor student attendees. There are good examples of other professional conferences pursuing more sustainable solutions — convening in less expensive venues, minimizing or eliminating conference swag, foregoing a full print run of the conference program and relying on digital scheduling platforms, scaling back catering. We’ve attended conferences where there was a work exchange and volunteer option to help lower registration fees. We’ve also attended conferences in the US and in Europe that waive or reduce the registration fee for students traveling internationally. One favorite academic conference has long held the policy that no one will be turned away due to lack of funds. Working on OLCInnovate presentation in the hotel lobby. Securing resources for students to attend conferences is difficult work. We can advocate for conference organizers to pursue more equitable pricing, but beyond that, there are things we can consider to create possibilities for a more equitable and ethical conference experience for our students. 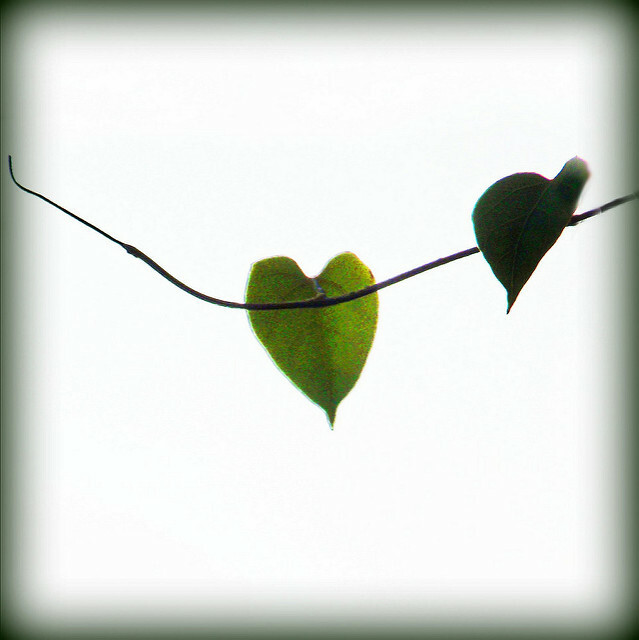 If we are able (and have the privilege) to navigate the undeniable global, financial, and personal barriers to attendance (none of which should be taken lightly and many of which are struggles for faculty and staff as well–see Rebecca Hogue’s post on this and all of Maha Bali’s writing on virtual conference attendance), we then have to pay close attention to the kind of experience we help structure for students in an environment that isn’t always or even often designed with their participation in mind. [Note: there are some wonderful academic conferences that are deeply thoughtful about centering student participation and that embrace this as part of their mission. They are not the subject of this post]. In this post, we want to reflect on some of the ways we practice valuing the voices of students in our work at conferences and at home. Reflecting back on our experience at OLCInnovate, we offer a few areas where practicing the value of student voice is critical. Really helping students feel welcome at conferences begins with getting really clear about why we’re encouraging them to attend in the first place. What are our goals for them in suggesting conference travel? It’s not sufficient to say, “come!” We must consider and articulate our understanding and beliefs about how their voices and perspectives enrich our work and learning within the conference. What are the individual and collective hopes for attending the conference? If we want students to attend our professional conferences, we need to mentor and model ways of engaging in conference activities that allow them to be more than a guest or an observer in an unfamiliar space. 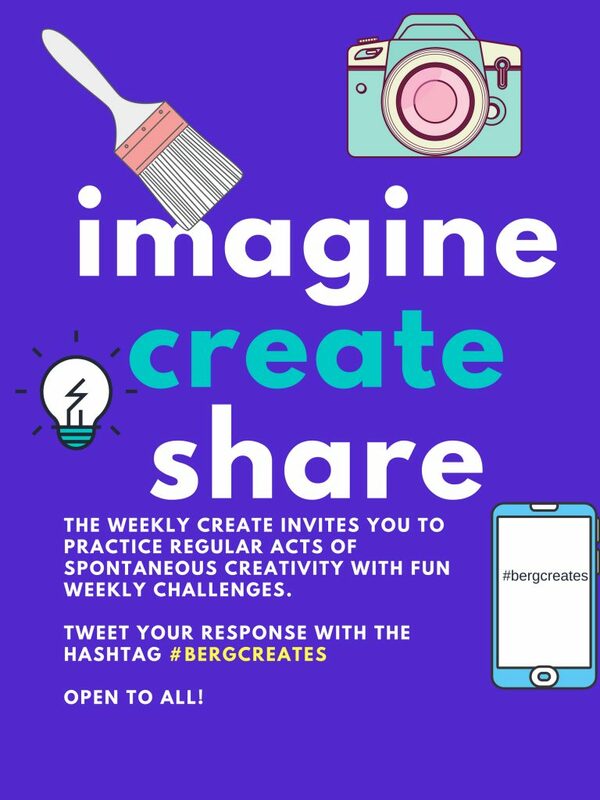 Can we imagine richer opportunities for students to participate as cocreators? Collegial pedagogy foregrounds partnership and recognizes the opportunity for growth for all participants. We see opportunities in the following moments to embody collegial pedagogy and invite others to expand upon them. The conference proposal: In what ways are students part of the proposal writing process? If students are preparing their own proposals, how are you supporting them? If students are part of your proposal writing process, how are you including them? Are they coauthors? Are they reviewing and commenting on drafts? What kind of feedback are you inviting from student collaborators and how are you communicating about that? Even at this early stage, students can have a clear sense of why they would want to attend the conference. What do they hope to gain from attending and how will participation support their current or future goals? We, too, make choices about which conferences to attend — choices based on the communities of practice to which we belong, based on conference location, the relationships we hope to renew and foster, exposure to experts and new ideas–we want the students to be involved in that process as well. Knowing why you’re there and having your own personal development in mind sets the tone for a more deliberative, thoughtful, agentive experience for students. The conference presentation: The same questions apply but gain urgency around the presentation itself. If students are presenting their own work, what do they need to know from you about the conference context, culture, and professional norms? What kind of opportunities can you create on your campus for students to practice their presentation and get supportive feedback before the conference? 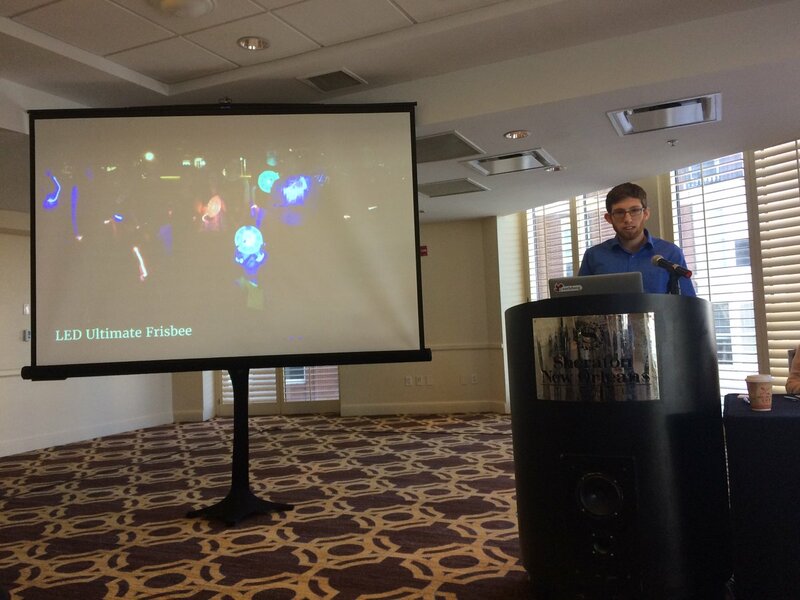 In a venue like OLCInnovate, it’s more likely the case that students are co-presenting with faculty and staff. Here the work of practicing the value of student voice as process is critical. What does co-presenting look like to you and how are you communicating that vision to your student partners? What do they envision co-presenting entails? An open conversation, early on, about these roles and partnerships is critical to practicing the value of student voice –not just as a highlight in someone else’s conference presentation but centered in the process. The conference experience: Are we encouraging them to attend sessions based on their academic interests or professional goals? Our responsibility is to model and make visible the choices that go into which sessions, events, and activities one might attend. Are we creating space in the day to debrief and synthesize how they’re participating and engaging? Challenging students to say more, to claim a kind of knowledge and ownership over their voices there? Are we helping them understand the value of their voice in the collective conversations happening not just in their presentation but in the hallways, in the lobby, in other presentations they attend? Practicing the value of student voice in proposing an idea, preparing a presentation and attending a conference means constructing a cocreative process that challenges us to engage with students as partners. This can be difficult, especially as conference deadlines loom and other pressures on our daily lives consume every minute up until we’re boarding the plane or getting on the road. But caring for the process of creating a conference presentation with students enriches the learning experience for all participants. For us, accompanying students to conferences is an opportunity to consider the other ways we practice valuing their voices. We should have. This reflection post serves as a reminder for us as well. As the year ends and we head into a busy stretch of conferences–from the Bryn Mawr Blended Learning Conference to Domains 2017–we are aiming to be more open to the ways that conference partnerships with students can transform how we practice and center their voices in our work. We are not new to this and we are certainly not alone. We think of Andrew Rikard’s Thoughts on the Limitations of Student Voice and we take deeply into our work his reminder that ‘Student Agency’ is Not Something You Give or Take. Perhaps creating more hospitable spaces for students at conferences requires us to reframe how we speak about students and their presence and positioning at conferences. We imagine we are not simply bringing students to Domains 2017, but practicing the value of student voice and agency in our domains work in the spaces where we share it out.